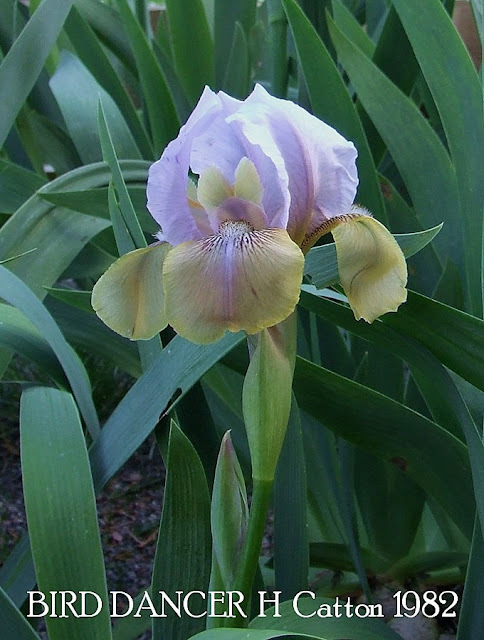 'Bird Dancer' another Stand out New Zealand Hybridised Iris by Hilmary Catton which is in full bloom today. What gives this intermediate iris its stunningly exotic look is partly due to its aril parentage. Purchased for the princely sum of $5.00 (For that price I recommend you purchase two) from Kingswood Irises 15 Railway Road Woodlands R D 1 Invercargill. Write to Marion Rutherford for their Catalogue which is on CD with some of the best Iris photos around. As I have said before This iris nursery I highly recommend! BIRD DANCER (Mrs. Hilmary Catton, R. 1982). Sdlg. C75-5-1. AB (OGB), 25½" (65cm), E. S. lavender blue, green gold midrib; F. green gold blend, blue flash beneath beard; white beard tipped bronze. Moon Spinner X King Henry. Wyuna Iris Gardens, 1982/3.